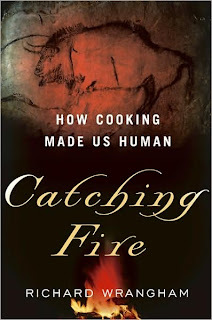 I have just finished a book by Harvard biological anthropologist Richard Wrangham called Catching Fire: How Cooking Made Us Human. meat eating leading to hunting abilities and strategic thinking in catching prey. Wrangham argues that cooking was what facilitated our evolution from ape to human. In his book Catching Fire: How Cooking Made Us Human, Wrangham looks at the central role that cooked cuisine has had on the biological and social evolution of humanity. Cooking makes food more digestible and increased the amount of energy our bodies obtained from food. As a result, our food processing apparatuses (jaws, teeth, guts etc.) shrunk and freed up our energy to support a larger brain. It takes a large amount of time to eat raw food. You can more easily digest cooked food, thus cooking reduces chewing, freeing up time to do other things. For example, if we lived on the same kind of raw food diet that great apes do – we would be obliged to spend 42% of our day (just over 5 hours in a 12 hour day) chewing. Cooking meant that we gathered around a fire and ate, so we began to socialise. Whereas we used to eat on the spot where we foraged. Fire is used for cooking. The use of fire provided warmth and led us to shed our hair as a hairless animal can warm itself by the fire and also provided a defense against large carnivores, permitting us to descend from the trees and live on the ground. Cooking developed a social system of economic cooperation, where the men hunted and the women gathered and cooked, and they shared food. Thus, humans became "human" because we learned to cook our food and use fire! I thought it was a pretty fascinating read and an interesting perspective on what makes us ‘humans’ different from animals. We can cook! Does any other animal cook their food? I don’t know of any. Can I borrow the book? Sounds interesting! (are your settings set so you can't paste urls in the comments? I had to type that one in by hand as it wouldn't let me copy/paste).